“Vision in the Church of the Holy Sepulchre (2015)” from Christian Faith Publishing author Betty Ramsey is an account of a profound experience that was had in Israel. “Vision in the Church of the Holy Sepulchre (2015)”: an exciting take on the feelings, divine visions and communication that was experienced while visiting the Holy land. “Vision in the Church of the Holy Sepulchre (2015)” is the creation of published author, Betty Ramsey, a retired school teacher of thirty years. Ramsey after many years of personal education and educating others, has found that being obedient to God and following his will is her number-one priority. Published by Christian Faith Publishing, Betty Ramsey’s new book describes the significance of the places that shape the history of not only Jews but to all other people who have a personal connection for the Heavenly Father. 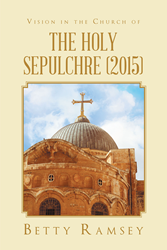 View a synopsis of “Vision in the Church of the Holy Sepulchre (2015)” on YouTube. For additional information or inquiries about “Vision in the Church of the Holy Sepulchre (2015)”, contact the Christian Faith Publishing media department at 866-554-0919.